Sticky: [Dev] Forum User Posting Ranks, Habbox God and Habbox Legend status! 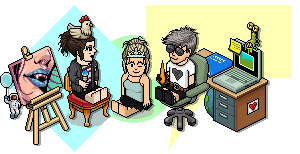 Sticky: [NEW] Habbox Official Rooms! Sticky: Been on the forum for 5+ years? Claim your VIP! Sticky: Been on the forum for 10 years or more? Sticky: [Dev] Listen to Habbox via your smartphone or tablet! Habbox Easter Eggstravaganza 2019 - COMING SOON! [Dev] NEW FORUM GOODIES! Easter Icons and VIP are now available in the shop! [Dev] Easter skin and logo update! STAFF OF THE MONTH ~ FEBRUARY & MARCH!!! Badr56 resigns as Habbox Staff! ps2man340 is now SENIOR events staff!